It was only the second time in the club’s history that they had lifted silverware, and once again it was one half of the Old Firm that they had to overcome to do it. They were dancing in the streets of Raith all over again on Sunday as Rovers clinched a dramatic Ramsdens Cup final win against Rangers at a packed Easter Road stadium. John Baird’s glory strike three minutes before the end of extra time sealed a stunning victory which ranks alongside the famous League Cup win over Celtic as one of the best days in the club’s history. Jimmy Nicholl’s 1994 team are regarded as the club’s greatest ever side – the pioneers who brought national silverware and European football to Stark’s Park for the first time – but Grant Murray’s class of 2014 are the first to follow in their footsteps. 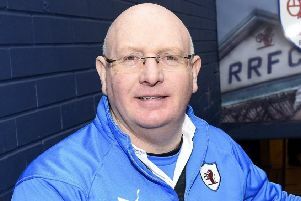 They are only the second Raith side to taste success, creating a new team of legends who will be revered for years to come. The Challenge Cup may be a lower league competition, belittled by some, but to Raith this is a special achievement, particularly considering the Old Firm opposition, and the scenes of celebration inside the stadium showed just how much it meant to the manager, players and supporters alike. An ecstatic Grant Murray said: “I told the players if they had belief and gave everything on the day they had a chance of winning a gold medal for themselves, and a trophy for the club, the fans and everyone in Kirkcaldy – and they‘ve done it! Just like ‘94, Raith went into the match as huge underdogs, even completely written off in some quarters. Some unflattering remarks in the national press only helped fire the team up for the big occasion – not that any extra motivation was needed. The players soaked up the pre-game atmosphere as the 4000-strong Raith support made themselves heard among the wall of noise generated by 16,000 expectant Rangers fans. This brilliant backing helped carry the team through 120 minutes of gruelling action. It wasn’t a classic cup final by any means, but nobody associated with Raith will care about that. Rangers will reflect on two huge misses, both glaring free headers that Bilel Mohsni failed to put on target, as key moments that cost them the game. But apart from those two let offs, Rovers defended superbly throughout the entire 120 minutes, with Lee Robinson making several excellent stops and centre-half Dougie Hill putting in a truly heroic display as he battled a shoulder injury. Those two were the stand-out individuals but this was one enormous team effort. The first half was a turgid affair as Rangers enjoyed huge swathes of unimpressive possession, while Raith struggled to keep hold of the ball as they barely managed to cross the halfway line. Mohsni should have scored with an 11th minute header from six yards which he sent over the bar, and Robinson made two impressive saves from powerful long range efforts from Ian Black and Steven Smith as a poor quality first 45 ended goalless. At half-time there was disappointment in the Rovers dressing room the players felt they weren’t doing themselves justice – but they were a different side after the break as they picked up the pace. The underdogs started to take the game to Rangers more, but it took the save of the match from Robinson to prevent Rovers falling behind two minutes after the restart as he superbly blocked Lee Wallace’s back post effort with his legs. Rovers took belief from their ‘keeper’s heroics and Callum Booth got their first glimpse of goal in the 55th minute but his composure deserted him and he sliced a wild effort across the box that ended up hitting the corner flag. Five minutes later, a slip from Ricky Foster let Calum Elliot through on goal but from a tight angle the striker could only fire across goal. Rovers were now growing in confidence, and frustrated Rangers fans were beginning to turn on their team. In the 65th minute Rovers again made their way into the ‘Gers box and the ball struck Lee McCulloch’s hand but referee Kevin Clancy, who used his whistle with frustrating frequency throughout the game, failed to blow on this occasion. Rovers had the edge for most of the second half, but the Ibrox side pushed for a winner in the closing stages of the 90 minutes. Robinson was at full stretch to make another great save, pushing away substitute Nicky Clark’s low effort in the 84th minute, before Mohsni again headed over the bar when it looked easier to score two minutes later. The game went to extra-time and that led to boos from unsatisfied Rangers fans, however the jeers almost turned to cheers in the first half of additional time when Nicky Law crashed a stunning volley against the post with Robinson motionless. At that point, you started to wonder if Rovers’ name was on the cup. It was backs to wall stuff from the Kirkcaldy side for most of the extra-time period and with the players dead on their feet, hopes were turning to penalty kicks and a possible repeat of 1994, when Rovers broke up the park to score the goal that will become part of club folklore. With the clock showing 117 minutes, a slip from Mohsni compounded his poor day and gave substitute Greig Spence something to chase. His persistence caused a mix-up between McCulloch and Foster that saw the ball break kindly for him in the box. The entire stadium drew breath as Spence charged for goal, and although Cammy Bell managed to make a good block from the former Celtic striker’s shot, the ball rebounded to Baird, who somehow kept a cool head amid the madness to steer the ball into the gaping net. The celebrations were incredible as all the Raith players, and most of the bench, chased Baird down the touchline towards the delirious Rovers fans – a golden moment to rival some of the best in the club’s 131-year history. Stevie Crawford’s opener and Gordon Dalziel’s late equaliser against Celtic in‘94, Danny Lennon’s free-kick against Bayern a year later, now add John Baird’s late winner against Rangers to add to the list of Rovers greatest ever goals. Captain Jason Thomson then lifted the Ramsdens Cup to create the historic pictures that will hang on the walls of Stark’s Park for decades to come, alongside the cup heroes of the past, and who knows, perhaps future ones as well. Raith Rovers: Robinson, Thomson, Paul Watson, Hill, Booth, Anderson, Moon (Mullen 78), Fox, Cardle (Spence 90), Baird, Elliot (Smith 86). Subs Not Used: Donaldson, Laidlaw. Rangers: Bell, Foster, McCulloch, Mohsni,Wallace (Faure 67), Aird, Black, Hutton (Clark 61), Steven Smith (Callum Gallagher 111), Daly, Law. Subs Not Used: Simonsen, Shiels.